Dogs Luv Us and We Luv Them: Iditarod Sled Dog Fever! Iditarod sled dogs and their mushers have been ripping up the Iditarod trail this week, heading for their final destination over 1,000 miles away, in Nome Alaska! Although some have made it in only 8 days it can take up to 15 days to complete the race depending on trail conditions! The race doesn't end until the last Musher crosses the finish line. We had the pleasure of traveling to Anchorage, Alaska last week for the ceremonial start of the Iditarod, the "Last Great Race on Earth". It was a real party! TV crews, Newspaper reporters, Local politicians, and Thousands of people from all over the world converged on the otherwise quiet city of Anchorage to cheer the dogs and their mushers on to victory! There were all sorts of characters milling around Anchorage at the starting line. 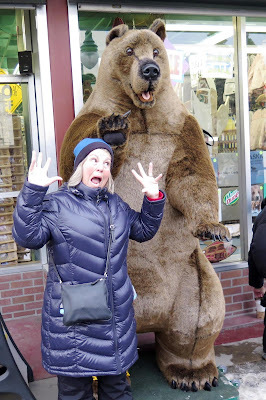 Holy Hanna, I was almost LUNCH!! Look! Even Chewbacca came out for the race. No that's not me in the photo with Chewbacca. Did you know that over the years Anchorage hasn't had nearly enough snow to support dog sledding? They actually have to deliver snow by the truck load from another part of Alaska! In one day they covered 3 miles worth of trail in Anchorage with snow delivered from outside the city. In addition, the beautiful glaciers of Alaska have been receding at a rapid pace. Climate Change is Real, folks. These dogs are having a snack of slump before the race begins. 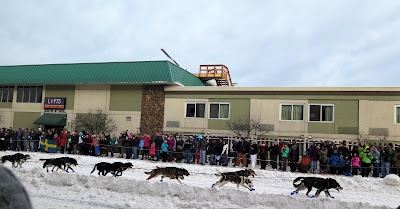 The Iditarod sled dog race is run not only as an exciting competitive sport, but it is run in honor of the Great Serum Run of 1925, which saved the town of Nome, Alaska from a deadly Diphtheria epidemic. The epidemic may very well have wiped out a significant number of indigenous Alaskan people, which would have been tragic. The Mushers and their teams are really dedicated, they all want to make the 1,000+ mile journey to Nome! You can follow all the race action on the official Iditarod web site. Have you ever been dog sledding? Would you like to? Leave us a comment, we always loving hearing from you! Looks like such an awesome time. I have never been on a dog sled. There was a video of a Canadian using a dog sled to go through a Tim Horton's drive in. It was so awesome we loved it! I can imagine how funny that must have been to see a guy sledding through a drive in, LOL! What it awesome race. I remember watching a TV show that explained how these dogs managed to get medicine to the people in Alaska back in the early 1900's. It's a race that has been going on for years, so amazing. Thanks for sharing this post and the videos. I love the story & history around the serum run of 1925. It's an incredible story, those dogs were amazing heroes & so we're their Mushers. It's an incredible heritage! What a cool experience to see them for real!! They are so beautiful and look so happy doing something they love!! It really was an awesome experience! I'll cherish the memories forever. The dogs really do love it, they are jumping up & down in anticipation. They can't wait to hit the trail! How cool you got to see it! Lately I'm upset over the snowmobile attack on those poor dogs. OMD I am devastated about the attack. One of the lead dogs, a beautiful dog named Nash was killed in the attack. They have arrested a suspect. I hope the responsible individual is severely punished!! It's such a tragedy. Wow. Alaska - that would be amazing. Yes, climate change/global warming is real. No doubt. Bizarre there's anyone who doesn't get it. (I think they are pretending for convenience). I agree with you, we can't close our eyes to global warming. We have to make our best effort to address it. Great video! I love the pink booties on the dogs. I cannot imagine attempting such a race, but I'd love to watch them! Thanks M.K., I'm so glad you liked the video. I got a kick out of the pink booties too! Mushers often throw booties out to the crowd but I didn't catch any - darn!